Picture below is a power supply for the amplifier based CT voltage. that's a simple schematic. using 3 Ampere of CT trasformator. output voltage of the transformer gets into the diode penyearah.ingat, do not let one connect 4 feet .Part diodes are already connected cathode is connected to the foot postitif elco. CT is the ground on the circuit and connected to the merger of the two negative positive elco. section connecting the anode of the diode is connected to the negative leg elco. You can also use the elco with the capacity 3300uf/50volt. Remember, use the size of the diode according to the impedance transformer. instances when the agency says 2 ampere transformer, then use a diode that has a capacity of 2 ampere anyway. based scheme, you see listed AC extra. it means that you can connect it to the tone control circuit that is equipped with an adapter. Supplying ct amplifier circuit using a series of very beneficial. with the power circuit mpli ct will feel fit. the sound will not be sluggish. besides the possibility na less noise compared to non circuit ct. Remember, use a diode in accordance with the size written on the ampere capacity of the transformer. because if the size of the diode ampere smaller then certainly the power supply circuit in the amplifier will rapidly heat even when left in a long time will cause a fire. If you do not have experience with this kind of thing, do not try it alone. ask someone who professionally for help directs you in the way of connecting wires to circuit components. since it is not recommended for people who do not understand about electronics. The use of diodes to be adjusted Based on the current strength issued by tranformator. 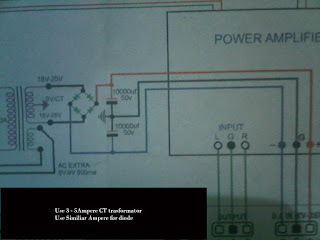 for example when writing transformer 3 Ampere then use the same sized diode to prevent the short circuit in the diode. Diodes illustrated by arrows based on the image above. using electrolit condensator must also be proportional to the output voltage generated by the transformer. when 18 volts then use Elco with a capacity of minimum voltage of 25 volts. It is useful for components like the battery did not explode during use. because this component can store electrical charge through the dielectric that is inside there. for a series of CT adapter, usually have to use two Elco. Because there are two poles of positive and negative voltage and the ground. it means that negative path is not connected directly to the ground. Trails CT contained in the transformer is connected to the positive and negative poles meetings Both pieces Elco. created where the ground lines to be connected to the audio circuit. with a record of such series are stereo. I am not responsible for all the mistakes you do when performing the instructions from this article. Be careful before doing the experiment and prioritizing your safety. thanks you for visiting this blog.